Nanduben Ishwarbhai Patel, 91 of Saint Cloud, Florida passed away March 18, 2019. 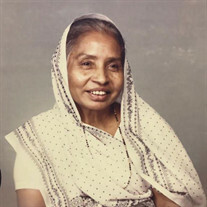 Ms. Patel was born October 22, 1927 in Dharmapuri, India to Trikambhai and Kashiben Patel. The family of Nanduben Ishwarbhai Patel created this Life Tributes page to make it easy to share your memories.